Here it is then. 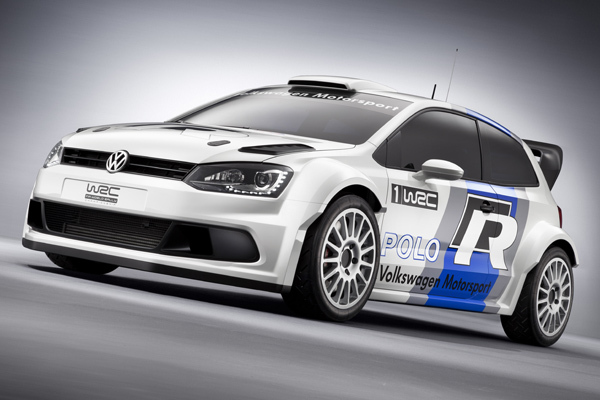 After months of speculation, Volkswagen has finally announced that it is to mount a full World Rally Championship (WRC) assault in 2013 with the wide-arched and aggressive-looking Polo R WRC. Pulling the covers off the Polo R WRC in Sardinia barely an hour ago, Volkswagen Motorsport Director Kris Nissen said, ‘We look forward to this new challenge and are working on this project with the same passion with which we won the Dakar Rally in the past three years.’ Final specifications are yet to be finalised, but expect 300bhp from a 1.6-litre TSI engine and four-wheel-drive. The timing of the unveil is significant: today is the eve of the Rally d’Italia Sardegna, and both Series 2 and Series 5 Polos were unveiled in Sardinia. New technical rules have come into effect in the WRC this year. For the first time, engines with a maximum displacement of 1600cc, direct-injection and turbochargers are permitted. Citroën, Ford and Mini currently field cars in the championship – DS3, Fiesta, and Mini Countryman respectively – and Volkswagen sees the WRC as a perfect fit. ‘Downsizing, high efficiency and reliability are top priorities for our customers. The timing of the Wold Rally Championship debut is optimal for Volkswagen. The big task of engineering a vehicle that is competitive and capable of winning at a large number of challenges holds great appeal for us,’ said Dr Ulrich Hackenberg, Member of the Management Board of the Volkswagen Brand, Development Division. Looks really good, hope it goes just as well and here’s hoping something resembling a road-going Polo R makes an appearance somewhere along the way. Awesome, can’t wait for the road going special edition(s)! WOW!!!! Superdupersuper 🙂 I want one too.